I wasn't feeling all that great as I was driving home from work today. My throat was a bit sore and my ear ached; nothing serious but enough to make me really look forward to getting home. It was a grey day, the sort of day where evening comes on fast, and as I pulled into our neighbourhood, the lights were already starting to come on in our little local mall, smoke was curling out of chimneys as people battled another day of -10, and the snow still lay all around from Sunday's storm. I was suddenly struck with the joyful and comforting premonition that I would arrive home to find all the lights blazing welcomingly in the house, a fire crackling, and my mom in my kitchen, cooking rouladen and spaetzle, with the tantalizing aroma of slow-cooked beef and homemade noodles striking me as I opened the door. I was well aware that my mom was not at my house, that her rouladen and spaetzle cooking days were long over by the time we moved into this house, but the vision was so intense and seemed so real and so certain that I felt all nostalgic, nostalgic for something that never was. 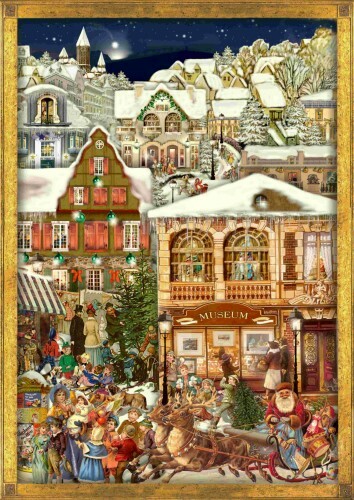 I remember feeling that way whenever I looked at a traditional German advent calendar we had when I was young. It was a shop-filled street in a town somewhere. It was a night scene and all the shop windows were lit up and filled with delightful looking toys that I longed for. Saint Nicholas - the rather stern-looking German one, not the jiggly Coca Cola Santa Claus - was riding in a carriage down the street in this town with children runnng to catch up to him. I remember that advent calendar filling me with the same longing for a past I have never known, feeling that same sense of deja vu for something that never was. What causes a person to feel something like that? Is it just wishful thinking caused by a weak moment (like when we are tired of being the mom and we want our mom to take over again), is it our subconscience tapping into a collective tribal memory, is it our weary brains escaping into a place of comfort for a short while? I often wished I lived in a composite town, and had a voice over narration as I walked along the streets. Its comforting to try and escape to the a painted idea of utopia every now and again. Usually when it starts to snow I get feelings for the picture perfect, and I know the memory comes from images I've seen, because my Mom can't really cook, so it can't be from my physical memory. But seeing the images makes me miss my family, because in my mind I've created the situation already. That probably makes no sense, oh well. I hope you're feeling less sick, and your fajitas sounded great to me (minus the chicken). Some days, I wish that rather than going to my apartment, after school, I'm going home and my Mom is there and when it's really cold outside, she makes us hot chocolate (like when I was a child)... but it never happens. I guess that when we are not feeling so well, we try to escape into a better world, where we are really comfortable and life is better. I often have a voice over narration of my life as well, Allison. But what you say about missing something that never was makes perfect sense to me. The mind is a powerful thing and even if your conscious mind knows it is fantasy, you still feel the emotions. hahaha, I got rid of the line about the chicken fajita so everybody is going to think you are either physic or nuts. I guess we all feel that way sometimes, Evelyne, although I don't usually wish my but I guess the conditions were just right to make me feel that longing. I think you are absolutely right that when we're not feeling well, it's easy to want to escape. Great post,Barb. I hope that you are feeling better, and that redness has gone away. There are times, as winter sets in and the days become shorter, when I feel a similar nostalgia for things that never were. An odd longing for an intangible. Spaetzle was never on our menu...but it sounds wonderful. Ummm, what exactly is spaetzle? I know I asked for you to send some snow, but what ever you sent melted en route. It's pouring down here. It seems to me that very grey or very bright days elicit strong emotions... I guess that's why some people are sensitive to a debilitating degree with weather changes. That's my grand DUH moment for the day. I like your tribal collective memory theory. It's comforting to be reminded that we're all connected & share mental security blankets that we occasionally snuggle against. As we both have German bloodlines I have similar thoughts at times. Perhaps we're thinking of a classic warm Germanic upbringing that never happened. I'm not suggesting for one minute that our childhood wasn't happy, but maybe the mystique of another type of family christmas was in our thoughts. The German symbols that we saw were merely romantic tokens like the advent calender. The pictures and cards always looked so beautiful, the crisp snow, the warm fires, the pretty lights, all part of a picture we built in our mind of christmas in another land. In reality christmas and life in general in Germany is pretty much like ours. It's no more romantic than the ones we enjoy, but it doesn't stop us thinking about another time and place. Hope you feel better tomorrow Barb. When I'm sick I want my mommy too, doesn't usually work out for me though. Hope you're feeling better. I thought I added this in my comment, but didn't. Just wanted to say your writing feels very much like home. That's the best I can do to describe it, sorry! Well written. It must have been an allergic reaction, Jas - it's much better today. I don't normally miss my parents. Wait, I didn't mean it like that, yes I miss them, but not in the sense that I want to return to childhood. I knew I should have put that snow in a freezer pack, GOB. Last time I use Fedex. Being of Italian persuasion, I suspect you would enjoy spaetzle. It's a homemade noodle, but the dough is thinner than regular noodle dough, so you have to squeeze it through a special holder with holes in the bottom directly into a pot of bowling water. The noodles come out all misshapen and irregular and are wonderful served with a sprinkling of fried bread crumbs on top. Come visit and I will make them for you. "It's comforting to be reminded that we're all connected & share mental security blankets that we occasionally snuggle against." What a beautiful thought, Michelle! I feel all we are the world right now. Seriously, though, I think you may have hit upon something there. Melatonin! Of course, I should have considered that. Ben, I believe you are right; I was romanticizing the idea of life inside an advent calendar, which likely never existed. Having cousins in Germany, I am aware that their lives are very similar to mine, but it's still nice to escape to that fantasy place sometimes. And I think that is what the entire Christmas industry is in fact based upon, they are capitalising on our desire for perfection and comfort. It never does, does it, Maureen, not after the age of 6 anyway. Much better today, thanks! Thanks Allison, that is so kind, and means a great deal to me, as I am always gobsmacked by your writing and how you manage to put into words things which I didn't even realize I was wondering about. Even though I'm almost 35ish, and I've lived on my own since starting university, I still call my mom when I'm sick. She's the one person who always, no matter how busy, will come over with a bottle of gingerale, some crackers, popsicles, etc. One night when I was deathly ill and she was working late, she gave a coworker some money to go to the store and deliver groceries to my apartment. I heart my mom. Now I am craving Sauerbraten. Great post. Awww, I heart your mom too, Karen! She's the tops. Would she consider adopting me? Me too, JACC. Actually I just bought ingredients to make rouladen and spaetzle, so there's going to be a big old German feast here on Sunday. Your line about a tumour got me saying outloud OMG don't even go there. Very nice post. The last line was some great comic relief. I can so relate to that feeling. I would love to escape into a wonderland right about now. I get nostalgic for stuff my grama used to make...even simple stuff like when she would make me toast with honey, grama always used soft white bread, and cut the slices into four pieces. I've only had Spaetzle twice, and it was amazing! NUM. Oh God, I wish my mom would cook like that again, except now I do it for her. I make the rouladen and spatzle and she remember sadly when she was able to do it. Her hands are crippled with arthritis now so those days are over. This year we will light the advent candles and I will roast a goose for Christmas dinnner with red cabbage and dumplings. Nice traditional german christmas dinner. No advent calender though. Did I mention how lucky I am to be able to take care of her now in our home? Just remembered, when I was in my 20's and living in Montreal I had a wisdom tooth pulled. It got infected and I was really sick. My mom drove by herself from TO to Montreal, first time she'd done that to take care of me. What was impressive was that she had only had her licence about a month. I guess I owe her now. That was my dopplerganger who sat beside you on the bus today, Barbara W. You could tell that it wasn't me because if you had checked you would have noticed that it didn't have a belly button. Rouladen is thinly sliced round steak filled with onion, parsley and bacon, rolled up and slowly cooked in red wine and beef stock. Spaetzle are homemade noodles. Dang, they're good. Oh hell, GOB - thanks for your conern sweetheart, but I am absolutely super. Someone as evil as I cannot remain ill for very long. You don't think it was a tumah then, John? Whew, I'm glad I get all my diagnoses via the internet. Awww, your grama sounds like a love, Mel. Probably knowing that she made the toast with honey for you made it taste so special. Spaetzle is pretty tasty isn't it? I actually have a spaetzle maker. Come over and I will make you some. That's a wonderful tale about your mom driving to Montreal, Rositta. It astounding what a mom can do when she feels she is needed. How lovely for both you and your mom that she lives with you. Sadly, my own mom lives a couple of provinces away, but I know my sister-in-law will sometimes make rouladen and spaetzle for her. She really enjoys getting some traditional food now and then. Your Christmas dinner sounds divine. Next time you are in Calgary, Mel, that's what you shall have. That sounded pretty damned profound to me, Kelly! It's almost frightening to consider how different we could be if certain pairs of alleles were switched. And of course, on a less cellular level, if one of your parents were someone else, what then? That's what I always found interesting about genetics (I didn't take an entire course in it in University, but it was part of a lot of courses), how it really is a big crap shoot. Good points you raised there, Kelly. ...and you are not evil. Evil is relative. I know. You should meet my relatives. hahahaha...at Eva's quote (of the day)!!!! Ummm yeah, I've heard about some of your relatives, GOB. I hear you. That made me howl a bit too, Allison. WHAT!?!?!! Who told you about my family? It was mother, wasn't it? [Calling into the distance] Mother!!! Aw great post Barb. I really love all the traditional pics you're putting up at the moment they're really lovely. Now, GOB, it wasn't actually your side of the family I've heard about, so leave your poor mother alone. Thanks Kees. Something about the snow and the cold we've been having, and the fact that Hallowe'en is over, makes me feel vaguely Christmasy I guess. So I borrowed these lovley images. i think there is something about grey days that makes one more nostalgic. maybe it's one of the few times that we allow ourselves our brains to stop focusing on stuff and instead, let it focus on what it wants to. when i come home cold and wet, and realize there is no hot chocolate and peanut butter on crackers waiting for me, there is always this ache inside of me. Yeah, grey days make us want comfort food, that's for certain, 668. Almost always involving massive amounts of carbohydrates. *LOL* LOVED this post, and could relate muchly.